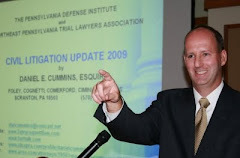 Here is a LINK to an article issued online Friday, Feb. 1, 2019 by the Pennsylvania Law Weekly entitled "New Class Actions Pile Up in Wake of Pa Justices' 'Seismic' Stacking Ruling" written by Max Mitchell (what a great name for a newspaper reporter). The article covers the fallout from the Pennsylvania Supreme Court's recent decision in the case of Gallagher v. GEICO in which that Court ruled that the Household Exclusion in automobile insurance policies was invalid as being in violation with the mandates of the MVFRL requiring carriers to secure waivers of stacking of UM/UIM benefits. If you are not able to access the article via the above Link, please email me at dancummins@comcast.net and I will send you a copy.